I had a good chase in Missouri and Illinois. No tornadoes, but lots of interesting storm structure, a gustnado or two, and some wild cloud motion. The day's setup included good instability developing ahead of a rather weak, poorly-defined, and slow-moving cold front entering northern MO and NW IL. Good low-level speed shear with some directional shear were forecast, but with weak upper winds and widespread precip predicted by the models, the risk of too many storms and multi-cell and/or HP storm modes would likely make chasing challenging. Still, such good low-level shear and instability so close to home, combined with the certainty that storms would occur, made it an easy decision to head out and chase. The favored areas appeared to be central and NE MO and west-central IL just north of the STL area, so I was able to watch and wait at home for a while given the setup being so close to home. By late morning, storms fired NE of the Kansas City area and began moving ENE. SPC put out a mesoscale discussion indicating these might be the beginnings of an area of storms likely to form across northern MO and become severe rather quickly. By 12:30 it was evident that this was happening, as the intensity and coverage of the storms increased as the area of storms expanded to the east. A tornado watch went up for much of central and NE MO and part of west-central IL. I decided to head out, with an initial target somewhere between Bowling Green, MO and Quincy, IL. Left home at 12:30, heading west on I-270, 370, and 70, then turning north on U.S. 61 at Wentzville. Intercepted first storm in Pike Co, IL just across the river from Louisiana, MO a little after 2:00. 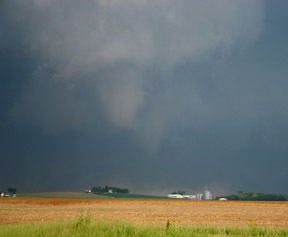 This was after I heard about SVR-warned storms both there and just to the west in Ralls Co., MO. The Ralls Co. storm crossed the river and I was able to get a good look at its updraft just across the river from Lousiana, MO. Though intense, it did not have any features to suggest a mesocyclone. It promptly surged southeast, forcing me to retreat back toward MO, and cutting off any plans I had of following it into IL. (My initial thought was to cross the river and follow it into IL, dropping south to intercept the next storm.) However, since this was not an option without going through the heaviest part of the storm, I crossed back into MO and headed south to intercept the next storms forming to my southwest. As I was leaving the storm and approaching the bridge back into MO, I did notice (at first in my rear-view mirror) a brief, narrow dust formation which may have been a gustnado or may have just been a narrow plume. I stopped a minute to watch and it quickly disappeared - so it didn't last long whatever it was. By now, the storms were rapidly developing to my south and I knew I had to hustle back south or end up behind the line for the rest of the day. Luckly, I was able to catch back up, and heard SVR warnings around 3 p.m. for a new storm to my SW entering Lincoln Co., MO. 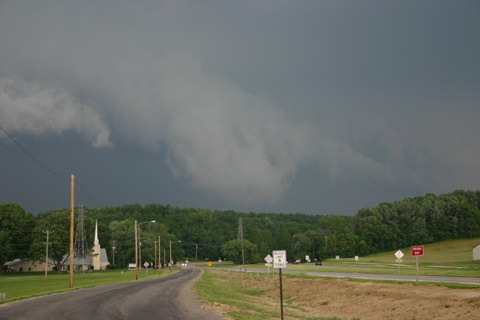 Once I got into position to view the storm, I caught a nice wall cloud northwest of Troy, MO. This picture was taken around 3:20 or 3:25 p.m. This feature gradually evolved into a more shelf-cloud-like feature, as the storm became more outflow dominant. Then another storm just to the south of that one went severe, and I would end up pursuing that storm all the way east to Highland, IL. By 3:30 or so, the NWS was reporting that radar showed both the northern and southern storm in Lincoln County to be severe, and the southern storm then prompted a series of additional warnings as I pursued it east (the northern one was moving into an area with no Mississipi River bridges, so the southern one was by far the more chaseable of the two). The storm got ahead of me for a while, but even though I briefly got caught in rush-hour traffic on I-270, I was able to see it the whole time and caught back up to it in Madison County, IL. 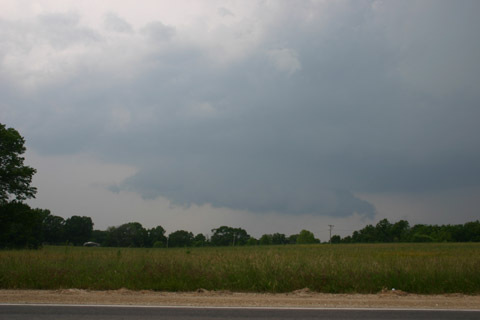 It was severe-warned through Lincoln and St. Charles Counties, MO, and Calhoun and northwest Madison Counties, IL. When the latter warning expired at 5, the NWS did not re-issue a new SVR, but did issue a statement saying the storm was still strong though not likely severe, but could re-intensify. It soon did exactly that, as around 5:00 I noticed a rapid-fire of CGs, and by 10 after 5 the storm was severe-warned again. Radar indications showed that the storm intensified near Wood River, IL, just around the time I was crossing back into IL on 270, which put me in nearly perfect position. I watched what looked like a wall cloud form over or north of Wood River, and stopped and got this picture looking north from just SW of Edwardsville, IL, looking north toward the SIUE campus from between the IL 157 exit and the campus on the campus access road. As the storm reintensified, it produced wind damage near Roxana and golfball hail near Edwardsville. 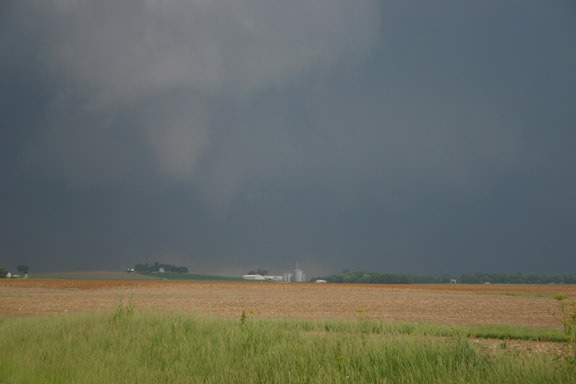 It also destroyed a barn and blew down some trees and large branches a couple miles north of Edwardsville, around or just after the picture above was taken. By the time I got the picture above, the storm structure was evolving again, with what had looked like a wall cloud over Wood River transitioning to more of an outflowish look, but with a couple rather low scuddy lowerings northwest and north of Edwardsville under what otherwise looked like more of a shelf-cloud type structure. I then pursued the storm east on 270 to the Illinois Route 4 exit, when it really kicked up a LOT of dust from Marine to Highland. The storm produced these lowerings near Marine, IL and kicked up lots of dust as strong outflow winds, perhaps from an RFD, surged southeast from just north of Marine into the north side of Highland. 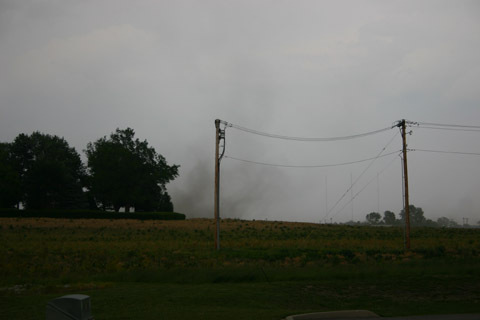 I continued east to Highland, where I saw this brief gustnado just north of Highland. After the gustnado dissipated, the surge of outflow continued into the north edge of Highland, producing this surge of blowing dust. Another storm to the south of Highland, moving northeast out of St. Clair County, then began to merge in, and I pursued this storm east on route 143 through Pierron to route 127, as it produced large hail in southern Bond Co. By the time I reached route 127, I knew I was not going to catch the storm as it was crossing Lake Carlisle to my east, so I called it a chase and headed home. Here are the Local Storm Reports from the St. Louis NWS. This does not include the destroyed barn, but after a news article and photos appeared in the Edwardsville paper a couple days later, I drove by since I was headed that general direction anyway. I saw the destroyed barn, a badly-damaged above-ground pool, and a few trees and branches down. 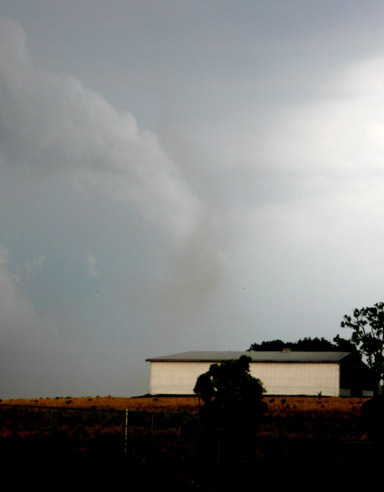 The damage was scattered and I could not see any distinct path, so I think it was more likely straight line winds than a tornado, though the people who lost the barn and the reporter who wrote the newspaper story wanted to think otherwise.